Last Saturday I was scouting for some home furniture at Stanzo Collection @ 1 Mont Kiara Mall. Stanzo Collection is a concept store for home and office furnishing. With the intention of searching for new wardrobe and cabinets however I found that their sofas set, bedroom set and office workstations also stirred my interest. There are so many things I wish I can have them in my home. Are you looking for new home or office furniture? Well, Stanzo is an Italian word for room. Therefore Stanzo Collection showroom takes after room concepts. Each of their showroom section helps us to visualize design better. For example they have living room, dining room, bedroom, reading room, playroom, workstation and office concept. Personally I find that Stanzo’s Collection furniture has the concept of sleek, contemporary and minimalist. The rooms look very spacious, organized and elegant. I also found that the furniture design are quite innovative, space saving and multi-purpose. This is what I called smart furnishing. The wood and material are from the finest quality with latest innovative design. Whether you're contemplating on redesigning your home or looking to design your new abode you can find a tasteful contemporary furniture and lighting at Stanzo Collection. If you are there, please check out this Red Dot Design Award Leather Leisure Chair from songdream. Croatia and hence Western-based “Prostoria” meanwhile bases its design along clean lines working in tandem with different shades of calm palettes, accentuated by bright shades such as passionate red and lively green. With a versatile collection of wood, steel and fabric furniture and furnishings, it is unsurprising the “Prostoria’s” multifunctional sofa model “Uplift” recently won the German Design Council’s prestigious Interior Innovation Award. 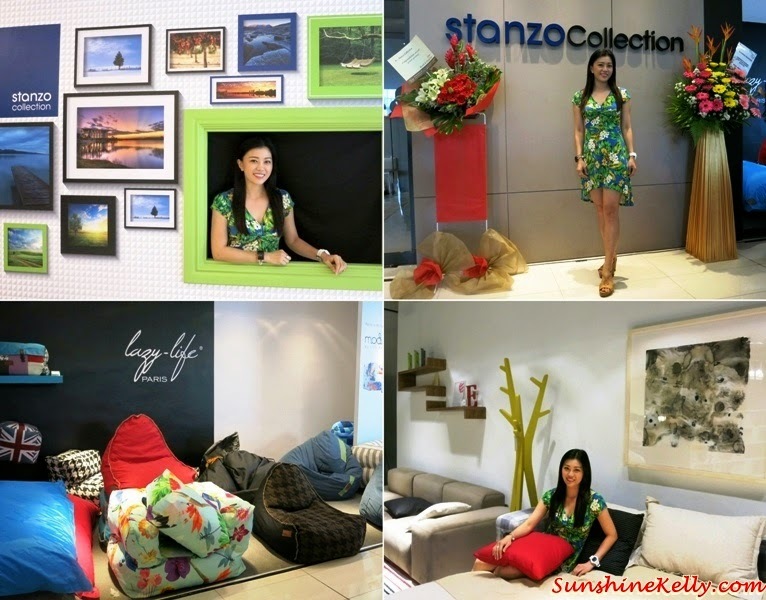 Stanzo Collection @ 1 Mont Kiara official opening was on 19th July 2014, the day I visited their showroom. Hopefully Stanzo Collection will have more branches in Malaysia soon. There were some special opening sales on that day. I spotted a Lazy-Life Paris leisure sofa that is so comfortable and so matching my dress that day. Should I? I will be going back to Stanzo again with my family to show to them the sofa. Stanzo Collection caters for the discerning and affluent home owners who are passionate about designing their home interiors by themselves. Overall, Stanzo Collection is the source of inspiration and furnishing to create the exclusive look for home and workplace. Great collection.. i want to buy same piece for my office.. please tel me where to buy..
Wow! These are indeed a great collection of office furniture. Being creative in renovating a house or an office is made easy when you have proper knowledge on the furniture that you are going to use. Make sure that your office furniture is ergonomic. It is important that it is comfortable as well as stylish and practical. Health and safety requirements need to be adhered to as many strains, aches and other work related ailments should be avoided.